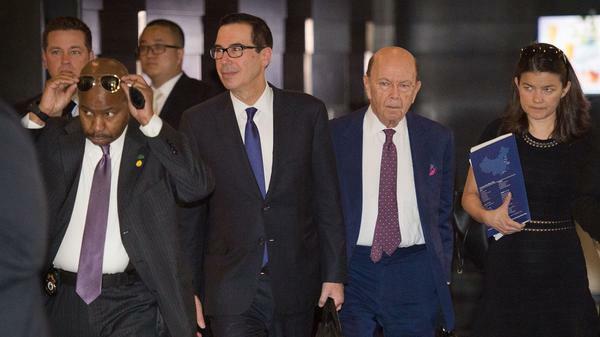 Treasury Secretary Steven Mnuchin (center left) and Commerce Secretary Wilbur Ross (center right) walk through a hotel lobby as they head to a state guest house to meet Chinese officials in Beijing on Friday. The talks included a "thorough exchange of views," Chinese media report. 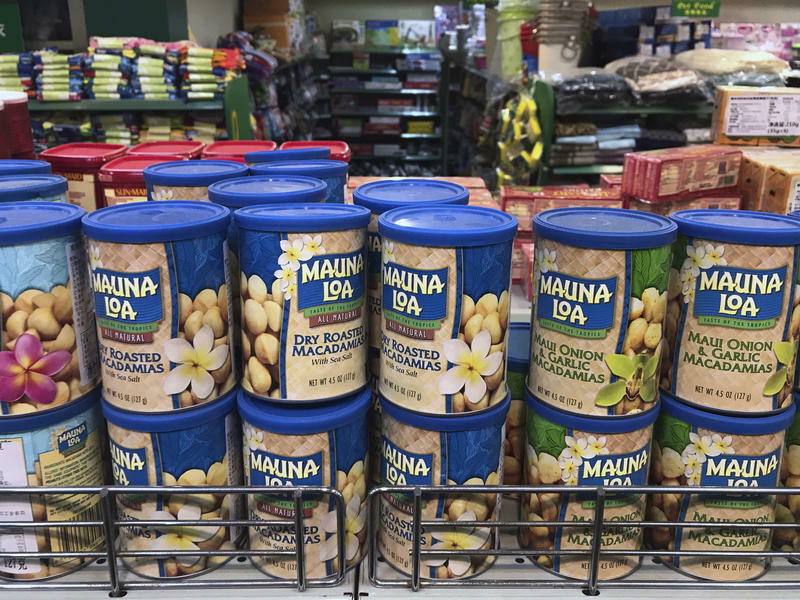 Despite the lack of tangible progress, Amy Celico, who was a China specialist at the U.S. Trade Representative's Office under President George W. Bush, says that to some extent in this case, no news is good news. "The fact that the result of the meeting wasn't slapping unilateral measures in place — as had been threatened in advance of the meeting — I think is a good one," Celico told NPR. After what China's state-run Xinhua News Agency calls a "thorough exchange of views," both sides agree that "considerable differences still exist." The Xinhua report did say negotiators reached "agreements on some issues" but did not detail what those agreements were. It added that both sides know that a stable trade relationship is vital for the U.S. and China, and that more discussion is needed. China hosted Mnuchin, Secretary of Commerce Wilbur Ross, U.S. Trade Representative Robert Lighthizer and other officials as the two countries looked to back away from the brink of a trade war — including threats of billions of dollars in new tariffs. "The official New China News agency calls the two days of talks frank, efficient and constructive," NPR's Anthony Kuhn reports from Beijing. "The Trump administration has so far threatened China with $150 billion in tariffs, and China has promised to respond in kind." The U.S. contingent hasn't released its own accounting of the trip, in which it met with a Chinese delegation led by Chinese Vice Premier Liu He. "There are real issues for U.S. companies operating in China," Celico said, noting China's closed business environment. "So I think the Trump administration is right to take action." She added, "The Chinese are very reluctant to make concessions here." The Americans brought a four-page document to China with a simple title: "Balancing the Trade Relationship Between the United States of America and the People's Republic of China." That document found its way to the media this week. A U.S. official speaking on background confirmed the authenticity of the document, in which the U.S. entourage laid out a wide-ranging list of American demands. The U.S. trade deficit with China must be cut by at least $200 billion by the end of 2020. China must stop "market-distorting subsidies" that harm U.S. innovation and development. China must cease cyber attacks on "U.S. commercial networks and cyber-enabled theft targeting intellectual property, trade secrets and confidential business information." China will not retaliate if the U.S. restricts Chinese investments in sensitive U.S. technology sectors, or areas that are critical to U.S. national security. China should not distort trade through investment restrictions and must be transparent in its rules. By July of 2020, China must cut tariffs on products in most sectors to levels that are not higher than U.S. tariffs. The document states that "China's tariffs and non-tariff barriers are significantly higher than those of the United States for most tradable goods." The Chinese delegation came in with its own list of demands. 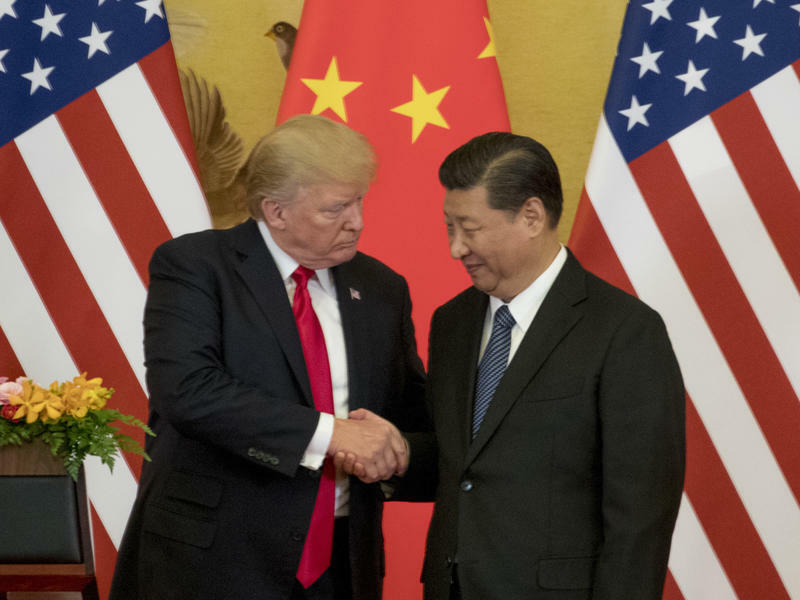 The Wall Street Journal, which reviewed the framework, said China's plan "demanded that the Trump administration end its investigation into allegations that China forces U.S. companies to transfer technology to Chinese partners and to cease its threats to impose tariffs on as much as $150 billion worth of Chinese goods." "The plan also requests better treatment for Chinese technology companies — a sharpening irritant in relations," the Journal said. "It asks that the U.S. 'adjust' its sales ban on ZTE Corp., a large Chinese maker of telecom gears, and allow U.S. companies and government agencies to buy technology equipment from Chinese firms, which would include Huawei Technologies Co."
Celico credits President Trump's aggressive approach as having forced China to respond to the Americans' longstanding concerns. But she also says that to make any real progress, the U.S. will need to involve its other large trading partners. "We absolutely need Japan, the European Union, Canada, others to join with us in standing up to Chinese unfair trade practices, and pressuring them to make changes to their policies," Celico says. "But our unilateral actions, I think, are making that more difficult. And so, absolutely I encourage the Trump administration — many of us do — to look to our allies and treat them well, as we look to ask for our cooperation with China." U.S. trade in goods with China topped $635 billion in 2017, according to the U.S. Census Bureau. That same year, the U.S. says its goods trade deficit with China was $375.2 billion. President Trump and Chinese leader Xi Jinping say they have agreed to work together on the denuclearization of North Korea and closer cooperation on trade. In a joint statement delivered at Beijing's Great Hall of the People with Xi, Trump praised the Chinese president as "a very special man," and earlier, he said the two enjoyed "great chemistry." The Chinese leader emphasized that while the two economic and military giants would occasionally have differences, there were opportunities to be "mutually reinforcing."